Tip: Share at least three family meals a week to foster better nutrition, greater academic success and good mental health in your children. Families are busier than ever, and aligning everyone’s schedule for a meal together can be challenging. In fact, studies show that nearly one third of children ages 4-19 eat fast food daily and many of those meals are eaten in the car. But children who share regular family meals reap numerous benefits, like better eating habits and nutrition, greater academic success, fewer risky teenage behaviors, and improved mental health. Furthermore, many of these benefits extend through your child’s teenage years and into adulthood. In our hectic society, family meals provide a daily respite that encourages connection and helps your children reach their full potential to lead happy, healthy lives. Regular family meals help young children build vocabulary, learn to communicate effectively and interact in socially appropriate ways. Research indicates that children learn more new words through family conversation during mealtime than they do from reading a book aloud with their parents. Good nutrition allows your child to develop both physically and mentally to their fullest potential. Children who eat regular family meals consume more fruits, vegetables, fiber, vitamins and micronutrients, and fewer unhealthy foods. These benefits early in life extend beyond the family dinner table, resulting in healthier eating patterns in adulthood. Students who have regular family dinners tend to do better in school. In fact, regular family mealtime is a more accurate predictor of higher performance in school than time spent in school, doing homework, playing sports or doing art. Many studies link regular family meals with less risky behavior as teens. Adolescents are less likely to smoke, binge drink, use drugs, or engage in violence or sexual activity when they frequently share meals with their families. Adolescents are more hopeful, positive and have increased self-esteem and resilience to bullying when they share regular family meals. Family meals are also associated with lower rates of depression, eating disorders and suicidal thoughts. For families with conflicting schedules, coordinating family meals can be a challenge. Here are a few tips to make it happen. Put it on everyone’s schedule. Choose times that are convenient and make sure everyone has family meal night on their calendar. It doesn’t have to be dinner. 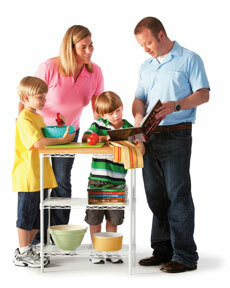 When coordinating a shared dinnertime is not feasible, choose another meal, like breakfast, as your family meal. Plan meals that are easy and family-friendly. Our recipes for Roasted Curried Sweet Potatoes and Rainbow Salad are quick, nourishing and universally enjoyed, so you avoid long prep times and squabbles over food. You can also try our latest recipe for a one-dish meal, Garden Spaghetti with Chicken. Take-out is better than nothing. If you haven’t planned a meal ahead of time, sit down for a meal of take-out. You will still reap the benefits of a family meal – it’s the togetherness that counts! Keep mealtime conversation warm, supportive and engaged. Shared conversation is responsible for many of the benefits of family meals. Unplug your meals. Eating while focusing on technology leads to mindless eating/overeating. Studies show that watching television while eating is associated with childhood obesity and poorer dietary quality among adolescents. And there is little room for conversation and connection when you are buried in your smart phones. Make a family policy that smartphones and other devices have no place at the family table. Aim for at least three family meals a week. While there is no magic number, the benefits of family meals begin to show with three or more per week. Coordinating family meals may seem like a juggling act at first, but once you get into a rhythm, family meals become a normal part of your week. Stay motivated by reminding yourself of the many benefits you are giving your children by making family meals a regular part of their home life.